Recently, the highly respected music blog Echoes and Dust published an opinion piece titled ‘ArcTanGent and the accidental death of Math Rock’. There’s no byline on the article itself, but a little digging reveals it to be written by E&D editor Dan Salter. The article caused a fair amount of consternation in Math and Post rock groups around the world, arguing in essence that the success of the UK’s ArcTanGent Festival has led to a dearth of originality and uninspiring copycats within the math and post-rock scene. If anyone should know about the seeming lack of fresh innovative music within these scenes it should be Echoes & Dust; they, like many music blogs and zines, make a concentrated effort to tirelessly review as many albums as they possibly can within their remit. This is the main asset music blogs have over their mainstream counterparts; they will endeavour to cover everything that is sent to them which is deemed applicable to the genres and styles they cover. I know this to be true because I’ve written a couple of pieces for Echoes & Dust myself in the past. It’s a noble pursuit and one that requires an extremely dedicated team of music fans who are willing and passionate enough to write about their chosen field for little or (in most cases) no money. As someone heavily involved and invested in seeking out new music in both the post and math rock straza, I do understand Salter’s sentiments. I can’t think of many albums that have come through from these scenes in the past few years that have got my blood pumping in quite the same way as Three Trapped Tigers’ Route One or Die, or Maybeshewill’s Not For Want of Trying or, to use one of Salter’s own examples, the self-titled album by And So I Watch You From Afar. But like it or not, this is the natural evolution or music. Of all art even. It is practically impossible to create something out of thin air and not be influenced by those who have gone before. Often this influence creeps in through osmosis, with the artist being completely unaware that they’re even imitating their heroes, until it’s pointed out to them weeks, months or sometimes even years later. I understand why it can be frustrating when a scene you love seems to be devoid of fresh ideas, but it’s a very introspective, inward-looking way to approach music journalism. Part of the joy that I get from my job is seeing that delight of discovery in other people. The sense of elation felt when turning someone on to a band that becomes a huge and positive influence in their life is unparalleled. It often makes the negligible pay, awkward social hours and writers gait associated with most who spend their 9-5 crouched over a keyboard seem worthwhile. That band ripping off Explosions in the Sky for the umpteenth time might not sound like the most revolutionary band of all time to you, but for someone new to elegiac cinematic, instrumental post-rock, they might be an absolute revelation. If your sole criteria for new music being good is originality, you are going to be severely disappointed time and time again. It is in our nature to replicate things that we have enjoyed in the past. The artistry comes in how you replicate those things, what other influences you meld them with, how they’re delivered, what artists have to say in their lyrics, how they deliver their music live etc etc. I should point out that the opening paragraph of Salter’s piece does state that ‘this is most definitely NOT a piece that aims to be critical of ArcTanGent’. But if ‘ArcTanGent and the accidental death of Math Rock’ is your headline, that is not the message that is going to be conveyed. There are several rather depressing studies that show the majority of people don’t read past the headline, but even more importantly, the headline shapes the way in which people read and remember an article. It might be tempting for a small music blog to mention the most successful festival in the post/math rock field in a headline as a means of boosting exposure, but if ArcTanGent’s not your target, why fire shots in the only part of the article that 60% of your audience is likely to read? Which leads me on to my original point... targets. Or more specifically, who you aim your sights at. I know for a fact that bands have indeed formed as a result of ArcTanGent’s existence. I quite often hear bands say that their one and only purpose is to play the festival. So in this respect, it seems only right to concede that Salter may have a point. Maybe ArcTanGent has caused a butterfly effect of sorts which has negatively affected the overall quality of the music it champions. When you expose an underground scene to more people, that will surely be one of the consequences. But it is a necessary one if the scene is to grow and thrive rather than be confined to hall-full rooms in pubs across the country. The positives of ArcTanGent’s existence far outweigh the negatives. I’d be surprised if any of the bands who have seen their profile rise considerably since the first ArcTanGent in 2013 see that as a bad thing! And surely the existence of music blogs like Echoes and Dust is to champion new bands they think are of worth. That’s my main motivation in music journalism and I have the added benefit of (sometimes) getting paid for my endeavours. So maybe instead of blasting an event that has single-handedly done more than any other to put the music you celebrate on the map, it would be worth instead pointing your sights at the bands that are merely regurgitating the watered down ideas of those who created a wildly inventive scene that would never have had a chance to get out of the back rooms of pubs across the country were it not for an annual event that brings together lovers of the awkward, widdly, progressive, ever-shifting, chin-stroker music. Finally, on that motif, I would like to point out a list of bands that I feel genuinely are striving to make something genuinely original, whether by combining multiple existing elements or coming up with something completely new. 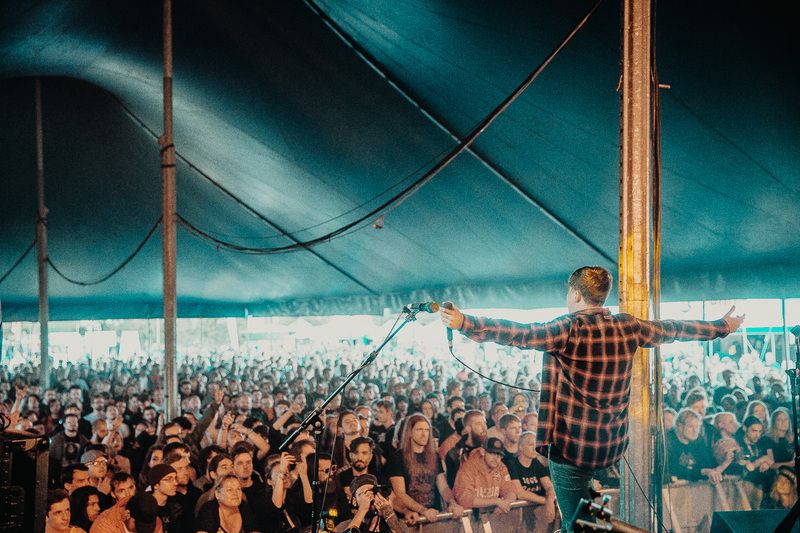 Bands like Raketkanon, Zeal & Ardor, Toska, The Physics House Band, Jambinai, Gallops, Myrkur, Brutus, Boss Keloid, Marriages, Mouse on the Keys, Rolo Tomassi, The Number Twelve Looks Like You, Human Pyramids, Boris, Lite, Charlie Barnes, Foxing, We Never Learned To Live, The Fall of Troy, Blanck Mass, Britney, Agent Fresco, Aiming For Enrike, and Deerhoof. Oh and by the way... all these bands have played ArcTanGent since its inception in 2013.